Professional boxing returned to The Strand Ballroom and Theatre in Providence last night, December 1 for the first time in 20 years and popular Providence featherweight Toka “T-Nice” Kahn Clary didn’t disappoint the large, raucous crowd. Kahn-Clary (24-1, 16 KOs) turned in a dominant performance, winning by way of a seventh-round technical knockout, over previously undefeated Filipino slugger John Vincent Moralde (19-1, 10 KOs), the WBC Asian featherweight titlist, to capture the vacant World Boxing Council (WBC) USNBC featherweight championship. “Real Deal Championship Boxing V”, presented by Hall of Famer Evander Holyfield’s The Real Deal Boxing, aired live on CBS Sports Network, the undercard was live-streamed on www.TheRealDealBoxing.com. Calling the action were Paulie Malignaggi, Steve Farhood and Barry Tompkins. The 25-year-old Kahn-Clary, who won the North American Boxing Association (NABA) title in his last fight, used a stiff jab and solid defense to frustrate his opponent early in the fight, setting the pace to take a decisive scoring advantage. 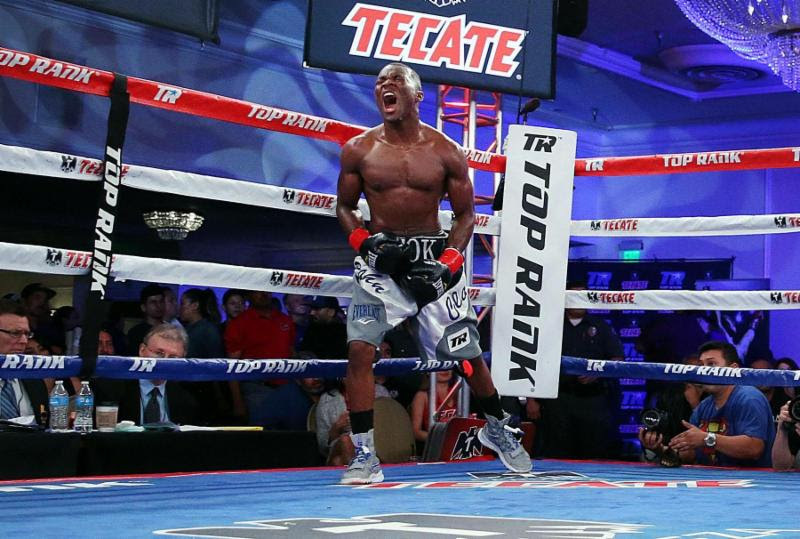 Toka-Kahn came out firing in the fourth round, applying more pressure to take full command, and he never let up. Rapid fire punches by Toka-Kahn, thrown from all angles, repeatedly landed on his overmatched opponent. By the end of round seven it was clear that the end was near for Moralde and it came suddenly when Moralde couldn’t continue anymore. The American debut of undefeated Italian cruiserweight Fabio “Stone Crusher” Turchi (13-0, 11 KOs) was a clinic in last night’s co-featured event against Demetrius Banks (9-4, 4 KOs), of Detroit. Turchi patiently applied constant pressure, methodically breaking down the game Banks and hurting his opponent with a flurry of punches in the third round. The end came when Banks failed to answer the bell for round five. “I’m so happy,” Turchi remarked after the fight. “This was so emotional for me because it was the first time I fought in front of Evander. I’m happy with my performance but I think I could have done better”. In the CBSSN televised opener, red-hot featherweight prospect made Irvin Gonzalez (8-0, 7 KOs) made the most of his national TV debut, switching freely from orthodox stance to southpaw and back throughout the fight, en route to a sensational third-round knockout of Colombian knockout artist Marlon Olea (13-2, 12 KOs). The lightning-quick Gonzalez, of Worcester, MA, consistently beat his opponent to the punch, and finished off Olea with a straight right to the body to keep his perfect pro record intact. Olea was fighting in the U.S. for the first time. Local favorite Nick DeLomba (12-2, 2 KOs), representing nearby Cranston, RI, pleased his supportive crowd, registering a hard-fought victory by way of an eight-round unanimous decision versus Bronx junior welterweight Louis Cruz (12-4, 6 KOs) for the vacant Universal Boxing Federation (UBF) junior welterweight title. Cruz was penalized a one-point deduction in the fourth round for a low blow. Scores were 79-72 and 78-73 twice. Two-time New England Golden Gloves champion Timmy Ramos (4-0-2, 4 KOs), fighting out of Framingham, MA, remained unbeaten, but he fought a four-round split draw with Worcester, MA junior lightweight Phil Davis (1-1-1) in an entertaining give-and-take contest. Scores were 39-37 and 38-38 twice. Philadelphia welterweight Poindexter “Savage” Knight (1-0, 1 KOs), a 2017 National Golden Gloves champion, had an auspicious pro debut, trapping Samuel Forjoe (0-2) in the corner right after the first bell. The gifted southpaw, a prized prospect for fans to keep an eye on, unloaded ten unanswered punches until referee Danny Schiavone halted the action at 1:03 of the opening round. Las Vegas junior middleweight Jeremy “J-Flash” Nichols (8-1-1, 2 KOs) opened the night with a six-round unanimous decision win over battled-tested Puerto Rican fighter Daniel Sostre (13-16-1, 5 KOs). Scores were 60-54 and 59-55 twice. Louis Cruz (12-4, 6 KOs), Bronx, NY.